The Secret Legacy: A Kate Brooks Adventure is a new release into the hidden object adventure genre from Meridian4. The game is full of many things. Some of them are fresh while the other ones are the replay of what we know from long ago. The way the hidden objects levels work is the refreshing part of the game. You meet the main character named Kate in one of the darkest moments of her life - at her grandmother's funeral. And that's where the adventure starts from. There she meets a man who tells her that she needs to clean up her grandma's office. When Kate arrives to the office she finds a letter from her grandmother where she warns Kate about the danger over her. That's when Kate realizes that her grandma's death might not have been an accedent. So now great adventures in Egypt await for Kate as she learns more and more about what her grandma found. 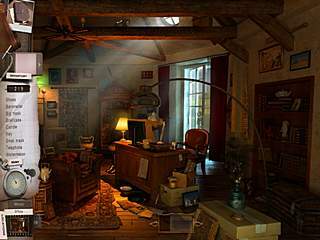 Those adventures include many hidden object scenes and interactive activity. The way the hidden objects levels work is the refreshing part of the game. They have this scrolling function. It means that you can't see the whole scene, but you need to scroll the the screen to the right or to the left in order to see the whole picture. You do this scrolling by clicking one of the arrows at the bottom of the screen. 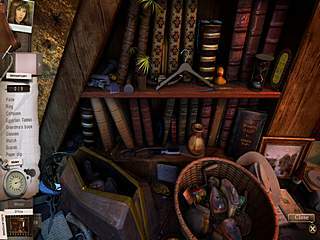 The hidden object levels are different in the way they give you the list of items to find. It can be just a list of words or a list of silhouettes. There was some bug with the classic list, cause the words didn't disappear as I found the items. That was a bit confusing. Another thing about these levels is that there is not hint to help you. That drove me crazy sometimes. Then there are also many challenges that require you to find some kind of inventory to proceed. Those challenges will get you wannder from one place to another back and forth. 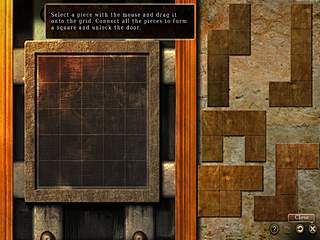 Another part of the game is the mini games. They are fun to play as a break from the general gameplay. The graphics are attractive and detailed enough for the players to enjoy the process. The dialogues are not voiced. So you will have to red them if you want to follow the story. The game is good, but the rule of thumb is that the trial version is always a good thing. This is The Secret Legacy: A Kate Brooks Adventure review. .